Unsweetened and with natural flavours. Captured at the source in France. With a hint of natural green apple flavouring. Drink Perrier the natural refreshing sensation. With only 2 calories per 50cl bottle. Our product is free from additives, artificial colours and preservatives. 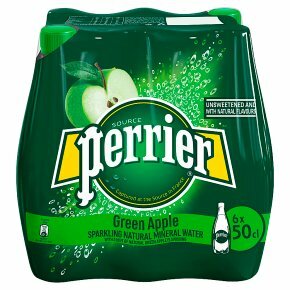 Perrier with a hint of natural green apple flavour is the perfect thirst-quencher to freshen up your busy day. With natural flavour, no sugar, no sweeteners and just 2 calories, there's no guilt here! So satisfy your sweet tooth by reaching for this unique burst of bubbles! So whether you are on the go or just chilling, freshen up your day with an incredibubble Perrier!